20th Century. (1943). 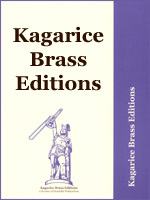 For 19-part brass ensemble of 10 Bb trumpets, 7 trombones, 2 tubas and timpani (10-0-7.02). Alternate parts for E-flat trumpet provided for parts 1 through 6. Trombones are 2 alto, 3 tenor & 2 bass. This is the original "long version" of the work as premiered in Vienna, 1943. Parts & score. 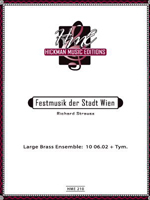 Note: There are two Strauss brass ensemble works that incorporate the phrase "Stadt Wien." This is the later, more elaborate of the two. The other work is our item 066463.